The Colorado Rockies lost to the San Diego Padres Tuesday night, which guaranteed a second consecutive series loss for the club and a losing record on their first homestand of the season. 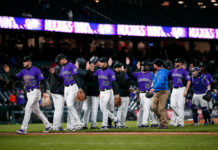 Colorado lost, 5-2, as their offense continued to struggle and Bryan Shaw gave up the first runs of his Rockies tenure. 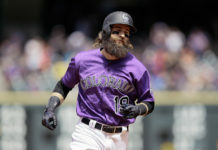 Manager Bud Black was forced to go with another quirky lineup Tuesday after Charlie Blackmon was scratched a couple hours before the game with tightness in his right quad. Blackmon was given rest in Sunday’s game because of a back issue. Further complicating Black’s lineup options is the fact that his squad is on the ninth day of a 17-day stretch with no off days. The Rockies struck the first blow when Trevor Story blasted a two-run home run in the bottom of the first inning off Joey Lucchesi to get the game started and Colorado on the board. The Rockies did not score first in either of their two prior games, both losses. But those were the only runs they would muster off Lucchesi (1-0, 1.72). After a clean second inning from both sides, the Padres scored their first run of the game in the third. With two outs, Manuel Margot doubled to center field off starter Tyler Anderson. Margo scored on an RBI double by Jose Pirela to halve the Rockies’ lead. Austin Hedges blasted a home run to left field in the fifth inning to tie the game at two runs apiece. Hedges’ home run would be the last run Anderson surrendered. Although he was not an overwhelming force on the mound, Anderson put the Rockies in a position to win a bullpen battle. Anderson logged six innings, allowing seven hits and two earned runs while walking two and striking out eight. 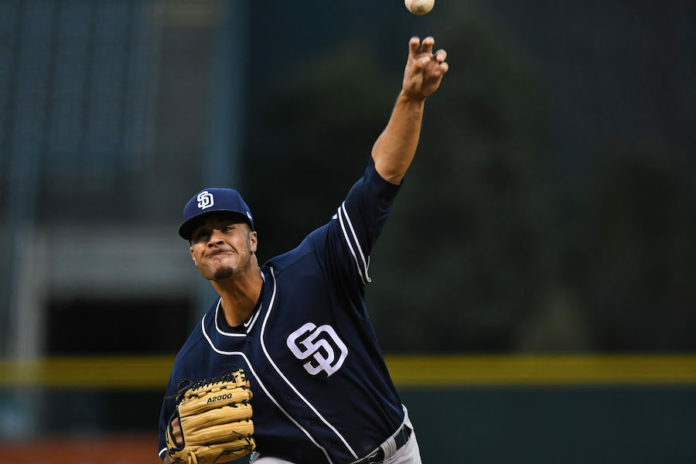 It was a nice follow-up start to his previous outing against San Diego where he took a no-hit bid into the fourth inning and finished with no earned runs over six innings of work. Bryan Shaw replaced Anderson in the seventh inning and allowed the first runs of his Rockies career. 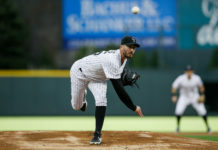 The 2018 offseason acquisition was making his seventh appearance for Colorado, having allowed only five hits and a walk over his first six. Shaw (1-1, 4.05) retired the first two batters he faced, Lucchesi and Margo, before Pirela lined a single to center and Eric Hosmer reached on an infield single. Hunter Renfroe took the first pitch he saw from Shaw, a 93-mph cut-fastball, and deposited it in the right field bleachers to give San Diego a 5-2 and final lead. Nolan Arenado tripled to lead off the Rockies’ half of the seventh, which Lucchesi followed by walking Story. That ended Lucchesi’s line at six-plus innings, with two runs allowed on four hits. He struck out eight and walked one. Lucchesi’s line stayed there because Kazuhisa Makita retired Ian Desmond (flyout), Gerardo Parra (strikeout) and Pat Valaika (foul out) in order to end the threat. Chris Iannetta singled to lead off the ninth inning, but Arenado grounded into a double play. Brad Hand earned his fourth save for the Padres. Colorado drops to 5-7 in the loss. Collectively, the team is hitting just .232 so far this season and has only scored four-plus runs in a game once in their last six contests. Colorado’s 101 strikeouts are second in the National League behind San Deigo, who won back-to-back games for the first time this season. NEXT UP: The Rockies conclude their series against the Padres Wednesday afternoon hoping to salvage at least one win. German Marquez (0-1, 6.52) will square off against Luis Perdomo (1-1, 6.00). First pitch is set for 1:10 p.m. MDT.